Pippa Middleton is the younger sister of the Duchess of Cambridge whose derriere became the surprise star of last year’s Royal Wedding. Now – in her new party-planning book Celebrate. A Year of Festivities for Family and Friends – Pippa Middleton has acknowledged the “startling” reality that she has achieved worldwide fame because Kate married Prince William and because of the unexpected focus on her bottom. Pippa Middleton, 29, admits: “It is a bit startling to achieve global recognition before the age of 30 on account of your sister, your brother-in-law and your bottom. “One day I might be able to make sense of this. In the meantime I think it’s fair to say that it has its upside and its downside. “I certainly have opportunities many can only dream of – but in most ways I’m a typical girl in her 20s trying to forge a career and represent herself in what can sometimes seem rather strange circumstances. “I am by nature an optimist so I tend to concentrate on the advantages. Celebrate: A Year Of British Festivities For Families And Friends is party-planner Pippa Middleton’s guide to home entertaining and goes on sale at the end of this month. In Celebrate, Pippa Middleton acknowledges the effect her sister the Duchess of Cambridge’s fame will have on sales, saying: “I know many of you will pick up the book out of nothing more than curiosity. “[But] I can assure you that it feels even stranger to me than it probably does to you to have seen so much written about me when I have done so little to paint a picture of myself. “This is my first chance to do that and I’ve enjoyed every minute of it. Last year it was revealed that Pippa Middleton – whose previous literary experience includes writing the online newsletter Party Times for the family’s business – had secured an almost unprecedented £400,000 ($620,000) deal for the book with publisher Michael Joseph. 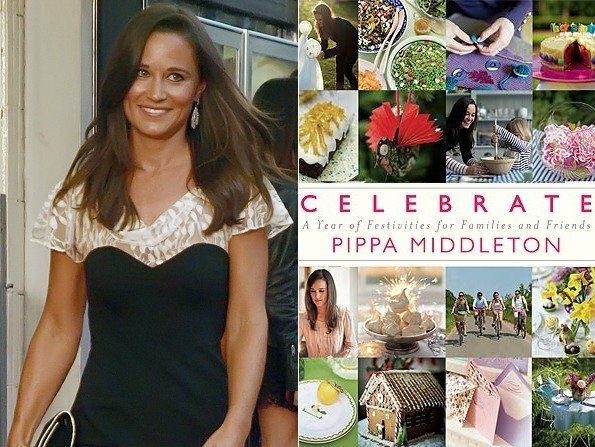 Pippa Middleton’s recipes are accompanied by glossy pictures of the author along with a selection of anecdotes recalling her childhood growing up with Kate in Bucklebury, Berkshire. Talking about Bonfire Night, Pippa Middleton says: “The unique sights, sounds, smells and tastes make this festival a particularly evocative one. “I remember the noise of the bells ringing at school as the effigy of Guy Fawkes we’d prepared earlier was carried out on a canvas stretcher, hoisted on to the huge bonfire and set alight. “Then the revelry would begin.